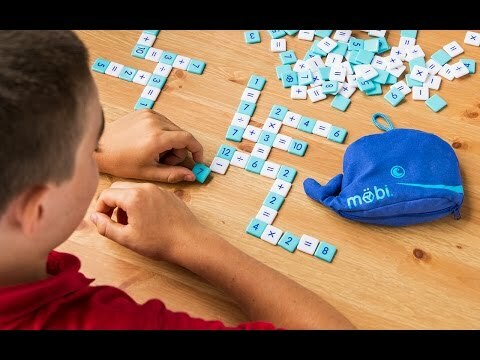 Möbi is a fun, fast-paced tile game that helps kids (and grown-ups) learn and apply basic math skills. Play numbered tiles and symbols to create simple equations. Use all of your numbered tiles first, and you win! 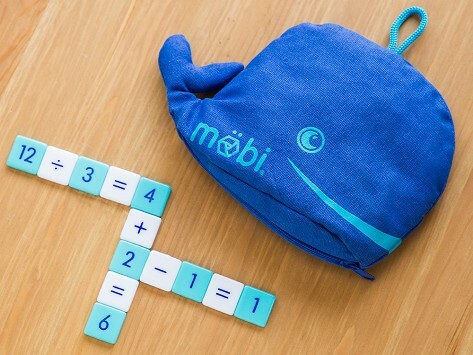 Packs away in an adorable blue whale bag, and it’s ready to play on any flat surface. Dimensions: 5.25" x 4.25" x 1.75"
Fun to play with the grandchildren, and they don't even realize they're doing schoolwork! I have had great luck with these sets for entertainment, but my secret agenda was to get the kids better at math! Our daughter really likes this, handy for math practice. Möbi is a fun, fast-paced number tile game. The goal is to make simple math equations as quickly as possible—a great way for kids or grown-ups to apply math skills. Plus, it comes in an adorable blue whale. Players draw blue number tiles, then use them to create simple equations (like 2+3=5) by including white math tiles (plus signs, minus signs, multiplication signs, etc.). Each valid equation is called a “pod.” Keep using your blue tiles to build new equations on those pods, almost like a crossword. The first one to use all their blue tiles yells “Möbi” to win. Wild card tiles and a few other creative rules make this a great family game. Want to play with younger kids? Just remove the multiplication and division tiles. With no scores to calculate or paper or pencils, all you need to play Möbi is a flat surface. It’s a great travel, beach, or picnic game. And it can help kids with hand-eye coordination, cooperative play, and automaticity, which is the ability to apply learning automatically without actively thinking about it. Wife-husband creators Vanessa and Mark Ellingson like classic word games (Scrabble, Bananagrams) that disguise learning as play. They wanted to invent a game their son, Noah, would stay interested in as he grows up. Whether or not you think you love math, you’re bound to love Möbi.